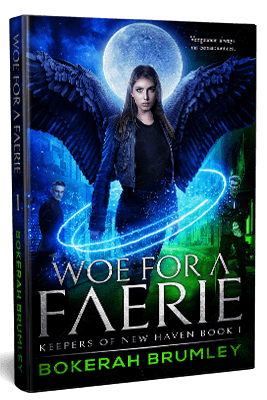 Woe will do anything for those she loves…including violate the angelic code that binds her. Her beautiful wings incinerated, Woe is cast out of the sky and down to the streets of New Haven City. She can no longer fly. The claustrophobic agony of being mortal leaves her helpless. After her fall, the mysterious Fae prince Arún saves her from an attacker, then abandons her at the church where she once served as a messenger. 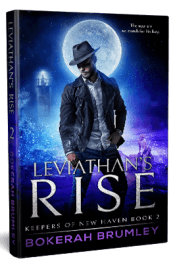 Left in the care of the brooding balance keeper Jason, Woe must learn to be human. And learn to live without her wings. Jason comes face-to-face with his humanity as his androgynous angelic messenger is dropped on his doorstep as a gorgeous mortal woman. His desire for Woe threatens his vow to keep New Haven safe. 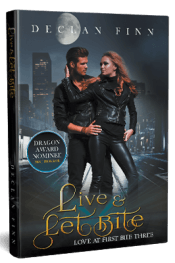 Can he convince her to join him and his Keepers, or will he lose Woe by pushing her too hard? Despite swearing off love and prophecy entirely, Arún finds himself drawn to Woe. The more he saves her, the more he falls in love with her. Will Arún give in to his destiny or deny his growing feelings for Woe? Woe must make a choice. She must choose who she will become, and which love will heal her. The reserved and down-to-earth Jason, or the wild, fairy tale devotion of Arún? Will Woe become a queen? Or a guardian for New Haven innocents? Bokerah Brumley sweeps onto the Paranormal Romance scene on angel’s wings with this fast-paced fantastical story about vengeance, redemption, and love. Readers will love her imaginative world and the clean, sweet romance of Woe for a Faerie. Who will Woe choose? Read Woe for a Faerie today to find out!